100 grs., original watercolor,9" x 11"
Class, today we are going to tackle the complex subject of macaron math. 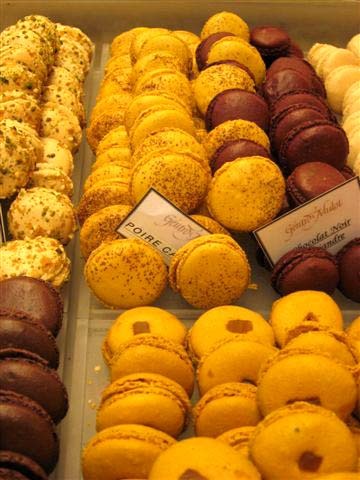 You walk into any Parisien patisserie and you are instantly dazzled by the array of colors and flavors. 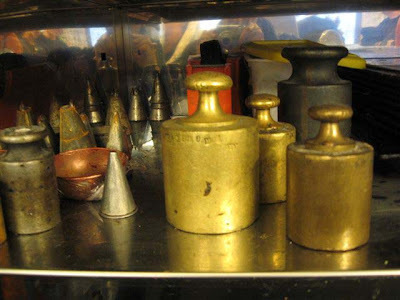 ...And the multiple array of flavors or parfums. Your first thought is how many to choose and which ones to choose. Correct? Then you take a look at the price (and you come down to earth with a thump. 66.00 Euros! You run from the shop tearing your hair out and shrieking. 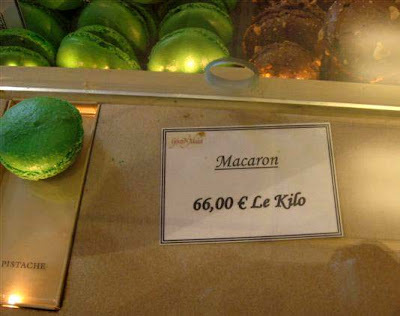 Here is where a little macaron math comes to the rescue. 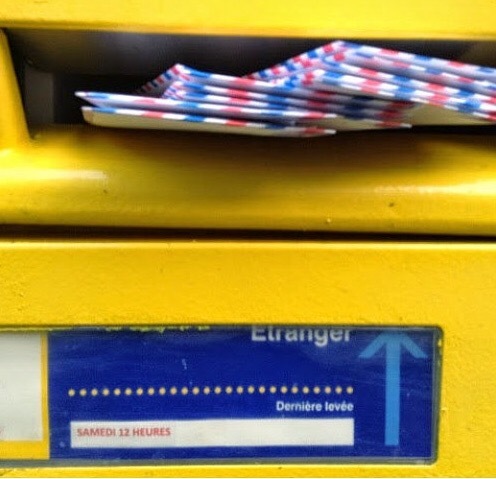 This will indeed help you when buying anything in France. You MUST learn the difference between kilos and grams. 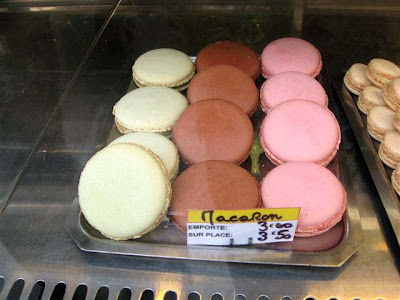 By the way, class, in these two pictures the macarons (large "individual" ones) are being sold by the piece. Please note you will pay a different price in you eat them sur place (on the spot) or for emporter (take it away). OK here's where the math comes into action. 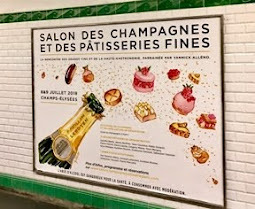 So if you are buying 100 grs (most often the case in patisseries) you will be getting around 3.3 ounces (just a bit under 1/4 of a pound and quite a managable amount to buy without costing an arm and a leg etc.). When you see this sign, no need to shriek or tear out hair. 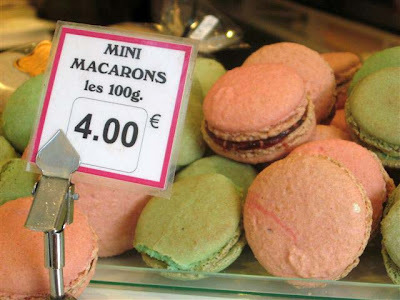 Simply know you will be getting about 4-6 very nice macarons or a little under a 1/4 of a pound and not too many calories at that. Remember these are much smaller than the individual macs previously mentioned. But here is another factor just to confuse you a bit. Most of the better patisseries will have a ready made pack of 100 grs waiting for you, so you can put away your calculators and start munching. Usually you can choose the flavors you prefer. Because their macarons are FATTER! Oui bien sur, and I got this from a reliable source. You will be tested on this tomorrow class, so please review your notes carefully. Say after me please, san gram (cent gram). My kind of math! I love that scale, Carol. I'm a Libra, you know, so the scales are always important to me. wonderful and fun post. I'm going off to study and memorize all this tomorrow in case we have a pop quiz. Ahhhhh, the stress of it all. 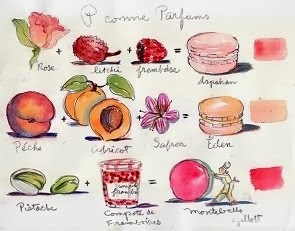 I am afraid I will have to go to a summer school class on this Macaron Math! And I still have to get you that photograph - I have not forgotten! I was in a state of Macaron Madness last week - I needed a fix. Tried to call Miel and received no response! I think that either they are on vaca or they have closed! 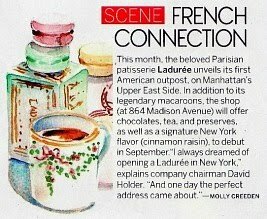 I love their fleur de sel caramels - oh no! I love your confident "swoop" of dark color on the scale at the top there and the mirroring shadow below. 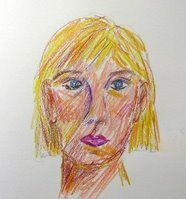 Oh my - I'm not sure if I like your painting (which is MARVELOUS), or the post(also marvelous!) better. The pics had me drooling, but I really love the tone of colors you used here. So all I have to do is divid 10 into the kilo price to get the 100 grs price! I LOVE THIS -- though I have to admit, if I ate all the cookies I'd like to -- I'd need a much bigger scale to tell me I shouldn't! Yes, ma'am. Thank you for the important macaron mathematics lesson. I feel very indebted to you. 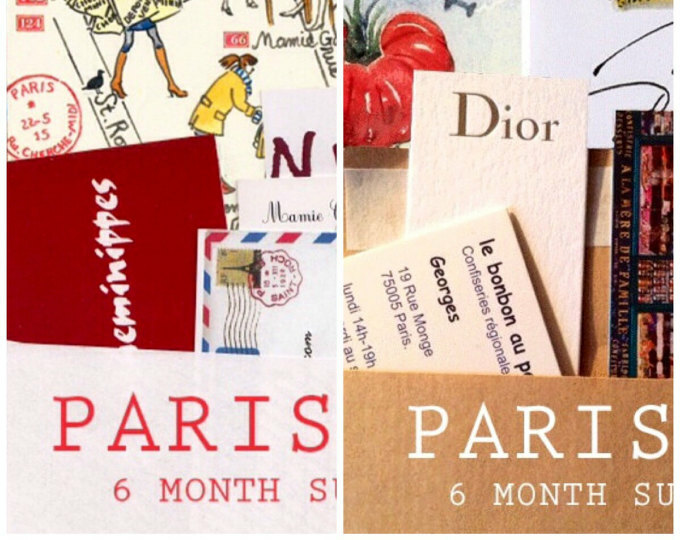 I will be visiting Paris in September for the first time. It is one of my dream to visit Paris. Your watercolour paintings and love of French patisseries are my daily dose of enjoyment before my bed time. Hope the test is open book. 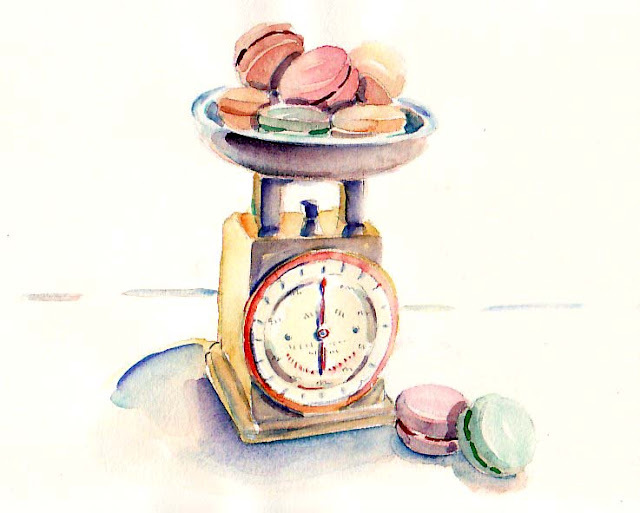 love your painting of the macarons on the scale. Okay, I've studied my macaron math test! 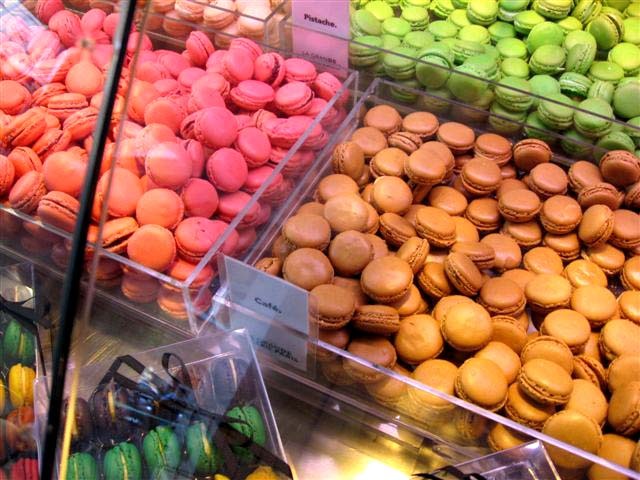 Now I want Macarons for Lunch- BY THE BUNCH! 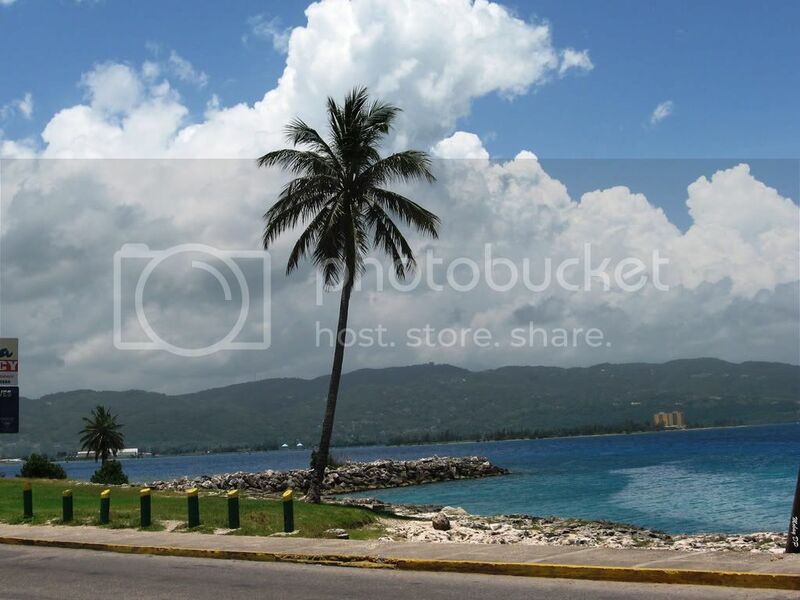 (I love your post too. 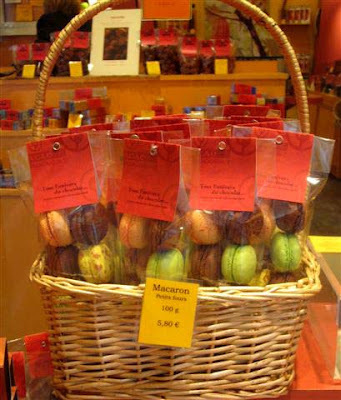 *sigh* I would probably gladly pay 66 euro for 60 of Pierre Herme's macarons. And I'd probably eat them all by myself too. Is that greedy math? A very timely class for me as we leave Tues for Paris. ...beautiful paints. 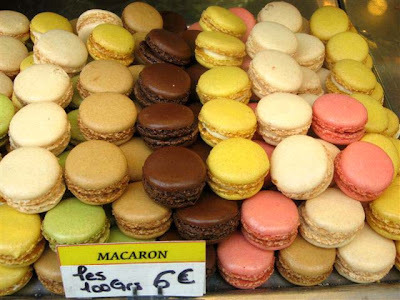 I love maccarons and i love PARIS!!!! 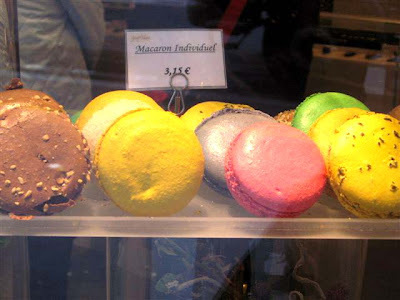 I love maccarons and i love PARIS!!!! I started trying to make them and would like to know what the colors signal. Pink=Strawberry or at least red berries, like raspberries maybe?? If I ever get it right, I'l send you proof.